A bargain on hard to find high quality .22 LR in a time when everyone seems to want you to pay more for the luxury of finding .22LR available. Fiocchi is a stalwart contributor to the massive American shooting market and has built an excellent reputation for delivering high quality ammunition at incredibly low prices that consumers can trust to be reliable and safe to shoot. This .22LR is just another great offering in the Fiocchi line. 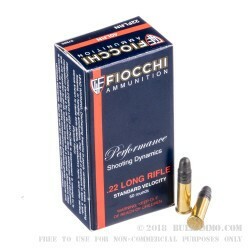 A straightforward 40 grain load that will function just about any firearm chambered in .22LR, because it offers a sensible set of ballistics and because it is reliable based on the fact that Fiocchi ammunition is composed of component parts that Fiocchi makes themselves in house. 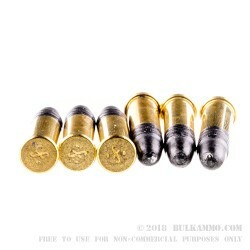 They sell many millions of rounds of ammunition every year and they rarely if ever get negative feedback on any ammunition across their entire line. To know where your components came from, and have a reliability factor so high, and then to be able to have the price you pay comport with the price you want to pay, that’s an excellent feeling. This is not just your bargain basement loose .22LR, this is fantastic factory loaded .22LR that you can count on. 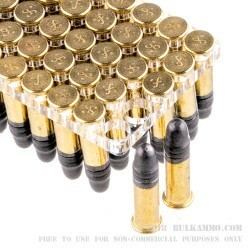 A: According to the manufacturer this ammo is rated at 1070 fps.